If you are walking the Camino de Santiago taking the Original Way, Lugo will be one of the city highlights of your journey. The only city in the world surrounded by intact Roman walls, Lugo owes much of its unique identity and character to its Roman past. Founded by the Romans in 15BC, the city got given the name of Lucus Augusti and was one of the three main cities in the province the Romans called Gallaecia. Gallaecia (which gives origin to the name of Galicia) extended all the way down to the Douro river in today’s Portugal and was an important economic source for the Roman Empire because of its gold mines. Lugo’s Roman wall was built in the third century to protect its citizens from invaders and the wall became a protected UNESCO World Heritage Site in 2000. The wall stretches over a 2km full circle that wraps around Lugo’s old town and historic centre, reaching 12 metres in height and incorporating 85 towers and ten gates. Five of those gates are relatively modern gates, opened since 1853 to adapt to the growth of the city. The gate called Porta Miñá (also called Porta do Carme) leads towards the River Miño and takes its name from there. This will be the gate used by pilgrims leaving the city of Lugo on their way to Santiago via the Original Camino trail. Porta Miñá dates back to Roman times and is the gate that has suffered less modifications over the centuries. 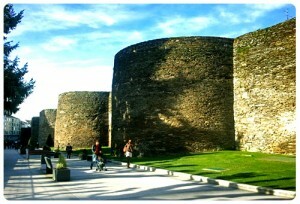 The best way to get a feel for the city of Lugo is by walking the loop trail along the top of the Roman wall. There is an interpretation centre dedicated to the Roman walls, as well as many archaeological remains from that period that can be found around the city, for those interested in Archaeology and the Roman Empire. There are also many other sites to visit in the old town, like the Cathedral, the City Hall and its many museums and churches. Being included in the UNESCO list of World Heritage Sites was a cause for great celebration not just in Lugo but for all of Galicia. To mark this event, a new festival celebrating the city’s Roman heritage and Celtic/Castro culture was created in Lugo: Arde Lucus (meaning ‘Lucus burning’, referring to the city’s Roman name). For a few days, Lugo becomes 3rd century Lucus Augusti once again, with Roman circus, Celtic weddings, artisan markets, many musical events taking place and locals and visitors getting into period costumes. 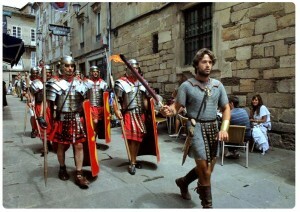 Arde Lucus takes place in late June, so if you happen to walk through Lugo on your way to Santiago and suddenly encounter gladiators and Roman Emperor lookalikes, don’t get alarmed! it is quite possible that Lugo has been taken over by the city’s Roman alter ego: Lucus Augusti. But while Arde Lucus has grown in popularity very fast since its creation, Lugo’s most traditional festivity is San San Froilán, dedicated to the city’s patron saint. San Froilán takes place in early October and it dates back to 1754 when Lugo got permission from the King to celebrate an agricultural fair. Today, not so much an agro business celebration, San Froilán gets thousands of visitors of all ages and one of its classic attractions is the famous Galician octopus dish, polbo á feira, (Octopus Fair Style or what other Spaniards call Octopus Galician Style) that can be eaten in one of the stands at the Rosalía de Castro park. 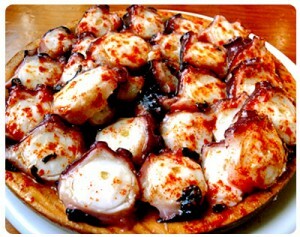 Octopus is traditionally a market or fair day dish in Galicia, simple and delicious. We are sure the Romans would approve!